I’m going to give you a full rundown of exactly what Contenu is all about. If you have a website or are thinking about starting a website, you need content. It gets old really fast having to come up with new content on a regular basis, 2 to 3 articles per week at a minimum… and that’s if you only have 1 website. I’ve got better things to do than to be stuck behind my desk writing another time consuming article for my many websites. Uhhg! I get tired just thinking about it. I recently read about a webmaster that quit writing any new content for his website for 8 months straight to see what would happen to his website in the SERPs (search engine results pages) and how that affected his traffic. Well… as it turns out, he lost over 40% of the traffic volume that he was getting to his website prior to the test. It’s been proven that more fresh content equals more traffic to your website with more chances to make many more sales in your business. I look for shortcuts in everything I do for my online businesses. A huge time saver for me would be to have a way to get fresh content on a regular basis that I don’t have to write myself and even better if I don’t have to pay someone else to write it for me. Easy, fast, unique, unlimited, legal, ethical and fresh content that you never have to pay someone to write for you. Now that’s what I’m talking about… if it’s legit… I’m all over it! All of is and more is what Contenu is supposed to do for us. Daily Results In 30 Minutes. 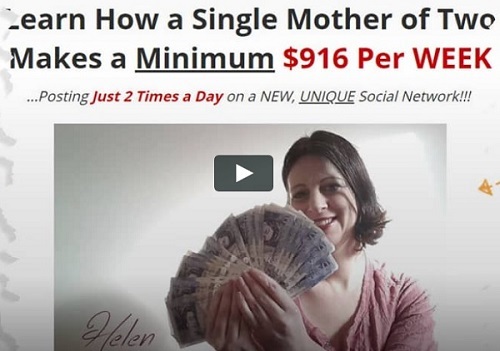 As well as showing a video of a single mother of two that makes a minimum of $960 per week posting content just 2 times a day on a new, unique social network using Contenu. I will go over these claims and see if they hold up. As it turns out, this is not some kind of generic content spinner like I thought it might be. What I’ve come to find is the Contenu WordPress plug-in is going to allow you to very quickly generate completely unique content in article format that you can post for pay on certain websites for $30 to $115+ payment each, all of which Contenu goes into great detail explaining the process of what type of content to target, exactly where to go and how to earn those amounts. This content posting for pay method is how the single mother mentioned above is making that $900 plus per week. The post for pay method is definitely the quickest and easiest way to make money from using the Contenu plug-in, but not the only way. You can also post the Contenu content onto your blog for display ad or affiliate offer income or create simple digital products out of them to sell as your own on various offer networks. There are several other ways to make money from the Contenu content as well. You can make money from Contenu without having to do any sales, promotions or advertising, so that part is certainly true. From the Contenu plug-in, you are able to extract 1000 to 4000+ words of content within a minute very easily. I was really impressed at how fast and easy the whole process was. The content is 100% unique because it’s being sourced from YouTube videos and converted to text. Per Contenu: “Contenu extracts the spoken word from any YouTube video and turns it into unique readable text in less than 60 seconds”. I know… I know… I was thinking the same thing when I first saw that… how in the world is doing that going to be legal? Surprisingly, I’ve come to find that this so-called instant content is completely legal and ethical to obtain and use. 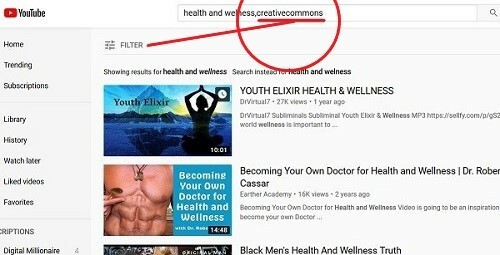 The Creative Commons license is how, as it allows for the use of the content in certain videos that are part of that network without copyright issues. 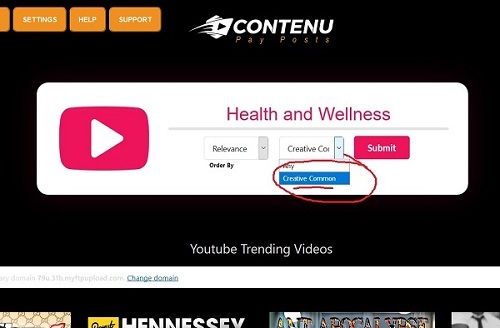 You do not need to go directly to Creative Commons or Youtube to use Contenu as Contenu will source everything for you automatically from within the plug-in. I’m just showing you the following so you know how Contenu works to get legal content for you. This whole process is done automatically from within the Contenu plug-in. You simply enter the YouTube video URL or the search terms and within 60 seconds, the content will come up for you to edit and post. The reason why this ripped content is legal to use is that the spoken words in the videos are not found in actual text anywhere else online. It would show up elsewhere if the video was scripted and that scripted text content was also uploaded somewhere along with the video. Most Youtube videos are not scripted and is why the majority of the videos you come across will work with this. 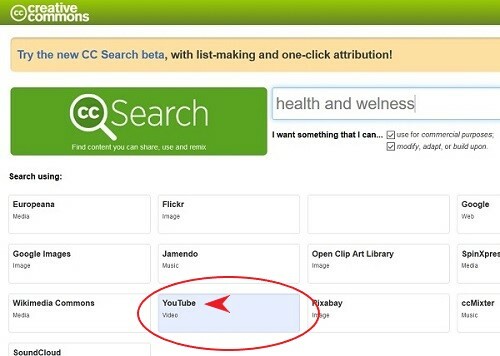 The Contenu Content Plug-In searches all YouTube videos that are part of Creative Commons network so you know for certain that there won’t be any legal issues if the video content was never put into text and posted online elsewhere. To be sure, this can easily be figured out by doing a Copyscape search (or other similar tools) to see if the content is indexed and found anywhere in text form preventing any plagiarism or SEO duplicate content issues. The following is a screenshot of a Copyscape results page showing a large portion of the page content coming up in pink highlights. In this case, the content couldn’t be used. However, in most cases, this is not going to be an issue, there will be no pink highlights found anywhere for content that passes this Copyscape test. If the content text is not found anywhere else, the 100% unique content can be used for posting or blogs etc. A minor issue I did find was that you will need to do some editing as I have found that there are some instances that I needed to clean up quite a few things here and there, but it didn’t take a really long time to make those changes. An example of this is that I had to figure out where one sentence ended and the next began. The content will come out as one long paragraph with no punctuations. It does take a few minutes when you are dealing with 1000s of words. It’s definitely not as fast to get to the finished content as Contenu leads you to believe, but it was still fast enough not to be an annoyance. For the most part, the content text is generally something like 80% to 90% ready to go. Not much of a down-side in my book though and certainly worth the hassle. It’s a whole lot easier and much, much faster than writing content from scratch. I also found that if I wanted to write an article about a certain topic from scratch because there was no exact Youtube video that matched, I could find something similar and use the word flow to help with ideas on what I wanted to put down. I found this extremely helpful in and of itself. 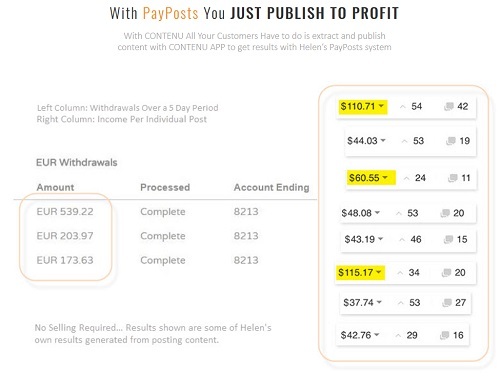 “Generate Passive Income From Instant Content in 3 Clicks”. Maybe a bit more than 3 clicks, but its still very fast and easy to get the content and post it for profit. “Daily Results In 30 Minutes”. Every extraction of content is going to vary in length and will require a different amount of time to get the content “post ready”. Still, it’s going to be fast enough and way faster than starting from scratch. I’m stumped to think of an easier and cheaper way to make money for the newbie than with Contenu. Not having to recruit, refer or sell anything to anyone is a major plus in this area. The content is definitely no cost after you pay for Contenu. In my book, Contenu is worth every penny and I would have been willing to pay a whole lot more for it… I don’t think I’ve ever said that before. “No Selling or Promoting: 1 Year+ of Verified Results”. This is correct. No recruiting, referring or selling anything to anyone to make money with Contenu. Yes, that’s true as well. No traffic is needed. Traffic generation implies the need to make sales in order to earn an income. There are additional costs, but they are minor. I would highly suggest you check your content against Copyscape prior to every post. 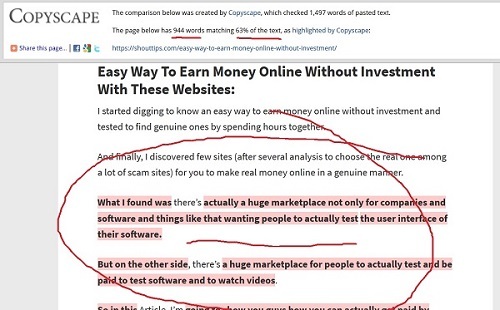 Copyscape costs about $0.10 per 1000 words checked. A $10 credit would last you a really long time, even with heavy use. However, there are free services that are almost as good as Copyscape. Since Contenu is a WordPress Plug-in, you will need a very basic WordPress website for this to work. The website doesn’t need any content on it or even be fully set up in order for the Contenu plug-in to work. I spent a little getting a domain name and a WordPress hosting account. The total cost there was $10 for the domain name and its $16 per month for the WordPress hosting. I used Godaddy for the domain name and WordPress website hosting and if you run into any trouble setting things up, Godaddy is there to help you with everything. So, it was extremely inexpensive, but not “no additional costs”. They may have been referring to it not costing anything directly from Contenu on a monthly basis as in a membership fee. That would be accurate, but they shouldn’t have stressed that it had no additional costs like they did. “Instant Monetized Content Without Writing a Word”. Technically, I did have to write a lot of words to replace words that didn’t make any sense to the software that pulls the content out of the YouTube videos. If the software doesn’t understand a word, it will try its best to come up with what it thought the YouTuber said in the video. For instance, it doesn’t understand the word “Contenu” and will replace it with something as close as it can, in this case, it was replaced with the word “Content” instead. I would have to edit that along with anything else like that. Minor yes, but definitely not nothing. “Evergreen System… Works In Any Niche”. As long as there are Youtube and sites like it, this will work, so yes, this is definitely evergreen. “5 – 30 Mins Per Project”. I find this to be a reasonable amount of time to edit your content prior to posting, but it will definitely lean toward the 30-minute side of that equation for most posts. Extracts Unique Content from YouTube videos. It turns the spoken word into text-based posts. Auto formats post for quick posting. Includes Post Tags and Images. Re-posts published posts to PayPost, the paid content platform, automatically. No selling or advertising is required or needed in order to make money from Contenu. Contenu is an excellent product and has a 30-day money back guarantee. It is the least expensive, easiest and fastest way to earn a full-time income online from home without having to sell anything to anyone, ever. I’ve only used it for a week and it’s already my favorite internet marketing tool. My biggest problem with marketing has always been coming up with unique content for my websites and now that problem is solved in a big way. This is definitely a legitimate way to make money online.